The Monument standing some 300 north of the Windmill car park was set up in 1961 to commemorate the first parade of the Tangier Regiment 300 years before on 14th October 1661. 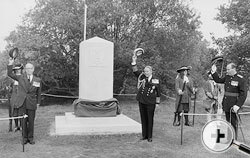 The Monument was unveiled by the Lord Lieutenant of Surrey and dedicated by the Bishop of Guildford. 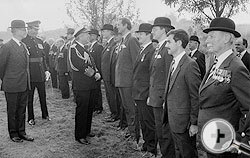 (then President of the Regimental Association) at the re-unveiling ceremony in 1986. 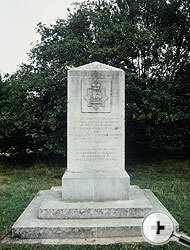 The Monument was originally only inscribed to The Queen’s Royal Surrey Regiment, which was then, the successor of the original Tangier Regiment. 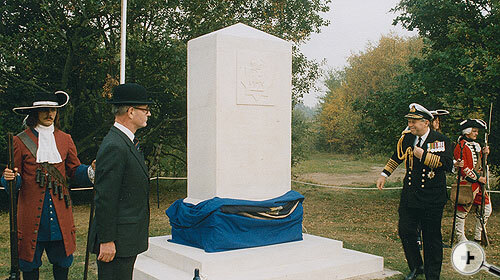 In 1986 it was re-unveiled by the Chief of the Defence Staff, Admiral of the Fleet Sir John Fieldhouse (previously Commander-in-Chief of the Force which recovered the Falkland Islands), with additional inscriptions to record that The Queen’s Royal Surrey Regiment had been formed in 1959 by the amalgamation of The Queen’s Royal Regiment (2nd Foot) and The East Surrey Regiment (31st and 70th Foot). The reason for the formation of The Tangier Regiment was that after his restoration to the throne in 1660, Charles the Second married the Princess Catherine of Braganza. As part of her dowry the Portuguese settlements of Tangier and Bombay were given to the British Crown. Unfortunately Tangier, at the entrance to the Mediterranean, was under continual attack from local Moor rulers, hence the requirement for England to establish a permanent force to defend it. The Tangier Regiment arrived in the town in January 1662, and was committed to many actions there over the next 22 years before, in 1684, it was decided to hold Tangier no longer and the troops were evacuated. The Monument, Putney Heath c1961. On its arrival back in England, Charles II referred to the 1st Tangier Regiment as ‘our dearest Consort the Queen’s Regiment’. From then on, except for one short break, the Regiment which is the senior English regiment of the Line in the British Army, being second only to The Royal Scots, the 1st Foot, was always titled and referred to as the Queen’s Regiment in one form or another. 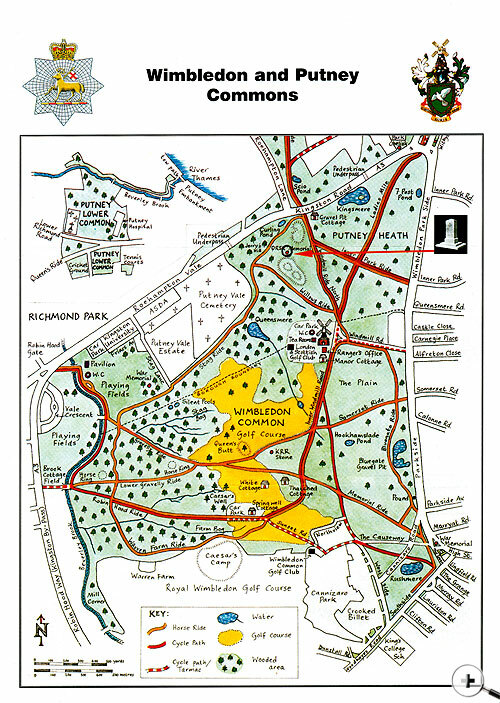 The Queen’s eventually became the Regiment of West Surrey, so the amalgamated Regiment in 1959 represented fully the County of Surrey, having Depots at Guildford and Kingston-upon-Thames with a strong continuing Territorial Army presence in the London Boroughs to the south of the Thames within the old boundaries of Surrey. The Regiment has taken part in all the major conflicts since the 17th century in which the British Army has fought, in Europe, in India, in North and South Africa and in Burma, China and New Zealand. In the First World War the Regiment formed 49 battalions and in the Second World War 24 battalions. Members of the Regiment have been awarded 14 VCs. There are Regimental Chapels in Guildford Cathedral, Holy Trinity Church, Guildford and All Saints Church, Kingston-upon-Thames. The Regimental Museum is located in the National Trust House, Clandon Park, West Clandon, near Guildford. The Museum staff will be pleased to give further information about the Regiment and its history. Note: For those who wonder how a Regiment could have paraded where the Monument stands; before the 1970s the area was flat and open and comparatively treeless. The mounds now surrounding the site were formed from the spoil excavated when the new route of the A3, with the roundabout and underpass at the top of Putney Hill was constructed.